What If We Said “NO” to 1:1? Last night, I had the opportunity to present in front of our School Board on the state of technology in our district. We reflected on the first three years of our LEAP initiative that brought 1:1 iPads to hands of every student at Eanes ISD. We talked about successes and we talked about mistakes and how we’ve fixed them. While we are still far from where we would like to be, I am blessed to have such a supportive staff, community and board that have helped make this program a success. In the coming months there will be discussions about what to do with future technology funding. While I made a strong case to continue the program, we know it costs money and that money has to come from somewhere. As I slept last night, a vision came to me in the form of a dream. It was a vision of an alternate universe that would have been my life and the life of this school district if we decided in 2011 not to pilot this innovative idea of 1:1 iPads. In this dream my life was pretty boring. I was doing a lot of training on Powerpoint. We were constantly struggling to buy enough digital cameras for classes. My budget was getting burned up on licensing Adobe software for film-producing and photo-editing. But as boring as my life was, it was worse for kids. As I visited classrooms, there was no technology except for the A/V equipment and the teacher’s desktop. The computer labs were still there, but they were now 7-8 year old machines that barely worked. Teachers fought for 45-minute time periods in the lab when they could, but ultimately, many decided it was better not to even go. We had mobile technology in the form of netbooks (maybe this was more of a nightmare than a dream) that were really nothing more than expensive paper weights. When we first bought the iPads, the common perception was these were solely consumptive devices. You could read books with them and that was about it. I couldn’t disagree more. I’ve seen students creating amazing works of art, publish books and produce movies because they had the power to do all of that at their fingertips. One very creative example came from Westlake High School Student Michael Bartmess. 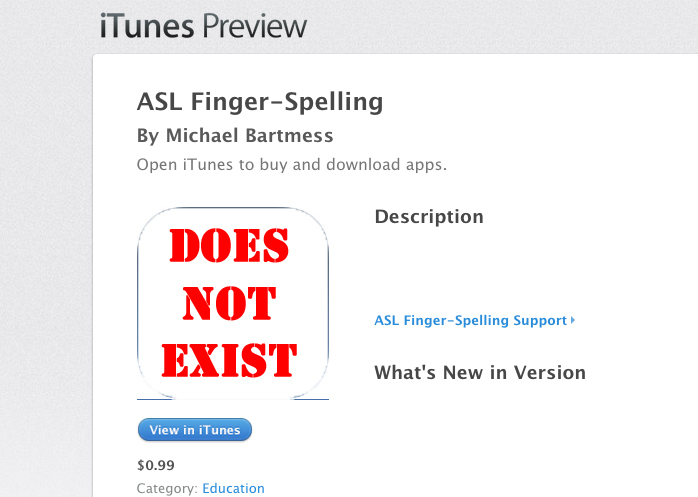 He was in need of an app to help himself and classmates with ASL finger spelling. When he couldn’t find one in the App Store, he decided to make his own. Where would his motivation to create this have come from without these devices? In this alternate universe, his app wouldn’t exist and thousands of kids would struggle with finger spelling in ASL classes around the world. One of the most inspirational spaces in our district is the “Juice Bar” at Westlake High School. It’s a unique mix of Starbucks cafe and Apple Genius bar all-in-one. Digital librarian Carolyn Foote’s vision for this space was transformative and ahead of its time. It provides students with a place to plan, collaborate and troubleshoot. In the world without 1:1, this area of the library would just be a sleepy corner that exists for 10-year old reference books to collect dust. I am blessed with the best team of Educational Technologists on the planet (a.k.a. the “iVengers”). In a 1:1 environment, the role of a Ed Tech as technology integrator is vital to success. Prior to our 1:1, this position was based primarily in a computer lab (because that’s where the technology was) and was centered mainly around delivering 45-minute lessons once a week. Now they are truly coaches working to collaborate, co-teach, and design lessons with teachers in the classrooms. In this alternate world, I think this position and the highly successful rock-stars holding the Ed Tech title would be long gone from this district and our teachers and students would suffer as a result. Having a 1:1 means having continual and ongoing conversations with parents about their role in the lives of our digital kids. I’ve spent hundreds of hours talking with parents, working with parents, and now teaching parents online about what it means to raise a kid in the 21st century. While I’d like to think that would have happened regardless of our 1:1, the reality is, in a world where every kid doesn’t have a device, what is the motivation for a district to support parents in this realm? We blurred the line between school and home, so we need to be the ones helping in both fronts. Without this initiative, the parents of our 8000 students would be left on their own to figure out how to navigate the world of social media, how to balance screen time, and how to help their children build a positive digital footprint for themselves. We are far from a paperless district. However, we have more and more content being moved digitally across our network then ever before. Pulling up our Google Drive stats today reveals that we have have more than 170,000 files, docs, sheets, and forms that have been uploaded or created digitally since 2011. Moreover, we just had our 50,000th document shared. That’s a lot of collaboration that doesn’t take place if everyone doesn’t have a device. If you take into account that many of those files would have likely been photo-copied and distributed and that a typical tree is made of about 80,000 pieces of paper, think about how many trees would not be here now if we said “no” way back when? While it’s nice to save paper, create an app, redesign a library and connect with community, this one to me is the most important. Students that are trusted with a device are also empowered. Traditional schooling exists to teach kids how to answer questions rather than ask them. Empowered students can amaze the world and we’ve been lucky enough to have multiple examples of this over and over again in our 1:1. From an entire class of 3rd graders becoming published authors in the iBook Store to a student creating an entire website to help her nephew with his illness, when you give students an opportunity to express themselves, you’ll be amazed at what they produce. 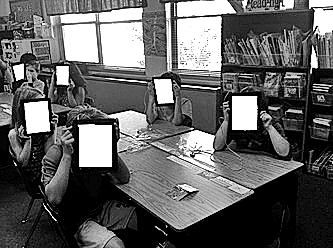 In this no-student-device universe, their voices might not be heard. A universe like that means that a teacher’s job might be a little easier because they don’t have to change anything about their practice. It means a parent doesn’t have to even think about what their child is putting on-line. It means that administrators don’t have to wrestle with Apple IDs or filters or restrictions. It makes the lives of all of those people a little more easier and a little more boring. But who are we forgetting in that scenario? They are the reason schools exist, not the other way around. We need to do everything we can to prepare them for an uncertain future and that means NOT taking the easy way out. For me, it means never resting until that becomes a full-fledged reality for this world. It means more work and less sleep. But in reality, why do I need to sleep when I’m already living the dream? This week some of the students and staff at our high school felt the affects of when social media can be used to harass with the app Yik Yak. While the app in this case is blocked on our devices and network, students were using their phones to participate in this harassment and cyber-bullying. What follows is the letter I sent to all Middle School and High School parents in our community. I’m sharing this with you all in the hopes that we can all be aware of not only this specific app but also the fact that we need to have a constant communication between parent, school and child. In light of this week’s incidents involving the inappropriate use of the app Yik Yak to harass Westlake students and staff, this is a good opportunity to open the door to a greater conversation we should be having with our kids about social media and their “digital footprint.” While we at Eanes ISD have taken the necessary precautions to block/restrict these types of apps on our network and devices, students still can engage in misbehavior on their own personal devices which can lead to serious distraction and, even more severely, possible prosecution. We are sharing these tools and resources with parents in order to quell bad behavior and open up a dialogue between parent and teen when about their digital lives. What follows is information about Yik Yak itself, next steps to take, other apps that can be inappropriately used,and where to go for help and support as a parent. anonymous, but they are not untraceable. This app has had many issues across the country at both high school and college level. While Yik Yak claims to have set up a Geofence (blocking cell data) around our schools, there are cases where students have been able to go out of range to post their messages. Here are some steps you can take as a parent to identify if this app is a problem for your child and what you can do to prevent its use. If your child has the app, you can search what Yaks they have posted by clicking on “Me” and “My Yaks” inside their app. This will show you what they have posted, but know they can delete their yaks. 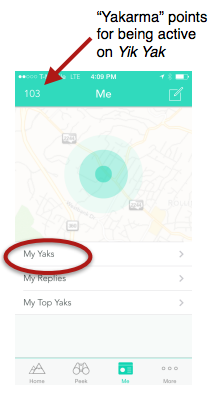 However, you can see if they have ever posted on Yik Yak (even if they deleted the posts) by checking their “Yakarma” points in the upper left corner. By default, it’s set to 100. If they voted on a yak, posted a yak, replied, or shared, the number will change. If your child is a Yik Yak user, a conversation needs to happen with him/her about why they feel the need to be on the app. We are recommending all parents delete the app from their students devices, especially since Yik Yak policy states that you need to be of “college age” to use the app. If you don’t see the app, but suspect it may have been downloaded, you can also check in the Updates section of the App Store under “Purchased” on your child’s phone. All apps ever downloaded are stored in there. While deleting the app takes care of the immediate issue, there may be a larger issue at hand when it comes to the use of social media by your child. Please take this opportunity to have that conversation about how NOTHING on the internet is truly anonymous or temporary. Here are articles about students being arrested for improper use of Yik Yak. They can help our students understand the seriousness of bad behavior on social media. So….What Else is Out There? For a complete list of these and other social media sites gaining popularity with Teens, check out this Common Sense Media article on 15 Sites and Apps Kids Are Heading to Beyond Facebook. Again, awareness is just the first step. We need to continue to have an open conversation about this and everything else happening in their lives. Social media may be a new thing, but there has always been a need to discuss issues and problems with our teens well before Yik Yak and long after it’s gone. We here at Eanes ISD are also providing multiple resources and platforms for parents to get assistance or to report any issues that may be discovered down the road. Individual campus Booster Clubs have offered to host “Parent Tech Talks” led by me throughout the next several weeks. (Contact your local booster club for more info) I also send out a monthly “Digital Parent Gazette” to those parents interested to alert parents of any concerns and showcase some great examples of how technology is being used in the classroom. To receive this newsletter, sign up here. 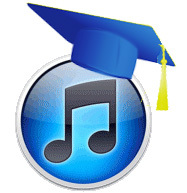 Finally, I’m excited to announce this year’s “Digital Parenting 101” iTunesU course. 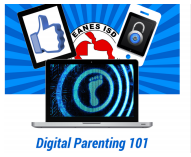 This is a free 6-week online course offered to Eanes ISD parents that covers a variety of topics such as social media, internet filters, device restrictions, and helping your child make a positive digital footprint. The course begins on October 6th and runs through November 21st. Click here for more information and to sign up! Thank you for taking the time to not only review all this information but also to have this conversation with your child. We know that it may be difficult, but it is important to have an ongoing conversation about social media and digital footprints. If you have any other questions or concerns, please contact either your campus administrators, counselors, or me. It takes a village to raise a child. The more we communicate the better the learning experience for our kids. Part of having any type of success in a school is to have the support of parents. While some schools can overcome a lack of parent involvement or support, most depend on the idea that “it takes a village” to raise a child. The same is true of any successful mobile device initiative. I’ve had over 50 talks/discussions/trainings with community members and parents in our district since the launch of the LEAP iPad Initiative in Fall of 2011, and that’s still not enough. We’ve hosted panels of parents discussing their concerns and values with technology use. We’ve brought in experts on cyber-bullying and internet safety. We’ve even had back-to-school nights where we’ve invited parents to see and use the device as a child in the classroom would. Knowledge is a powerful thing and lately, many parents are looking for more and more materials on what to avoid online, what to turn off and restrict, and how to help “stay ahead” of their kids digitally. The hard truth is parents will never be able to stay ahead of their kids digitally. Kids have more time and much less responsibility on their hands which means they can spend their free time trying to figure out ways to “game” the system and push limits. As parents, our job has never been so important, but at the same time, so challenging. We must now manage the lives of our actual kids and the virtual life they portray online. One of my darkest moments during our 1:1 initiative was also one of my finest hours. Following a highly attended parent orientation, I was encircled by about a dozen angry parents asking why we were “doing this to them.” In their worlds, they (thought) they had control over screen-time, online behavior, obsessive gaming, etc. Now the district has placed a device in the hand of every student and completely disrupted that well-maintained home life. As the parents pointed their fingers angrily and voiced their frustrations over this disruption…a strange smile crept over my face. “HOW CAN YOU BE SMILING?! ?” they shouted. Flash-forward a couple of years to this past spring. While parent turn-out at “Digital Parent nights” and various other events were good, we were still missing a large chunk of parents who couldn’t attend due to their own schedule. We decided to LiveStream several of these events, which helped with exposure, but I wasn’t sure we were really reaching those parents struggling to “keep up” with their kids. 1. iTunesU is super-easy to manage. The only time consuming part is gathering content and resources. 2. I wanted the parents to use their student’s iPad if possible to take the course. This helped model some of the educational expectations of the device at home. At the end of each week’s content (designed to take 2-3 hours a week), I gave a brief 10-question quiz to check for understanding. Parents that scored 80% or higher were emailed a ‘secret code’ that they would use to enter in the final exam to prove they completed each section. In addition, I used a free platform called Moot.it to create a discussion forum for Q&A and to stimulate some discussion over the weekly topics. All in all, the course went very well, but still needs some room for improvement. I’ve asked the “students” in the course to email me feedback and will use that to craft the next course I offer in the fall. That said, I’ve been asked by several colleagues to share the course with the public. So, with a little iTunesU magic, I duplicated the course, removed the links to the private forums, and made it public for anyone to use. 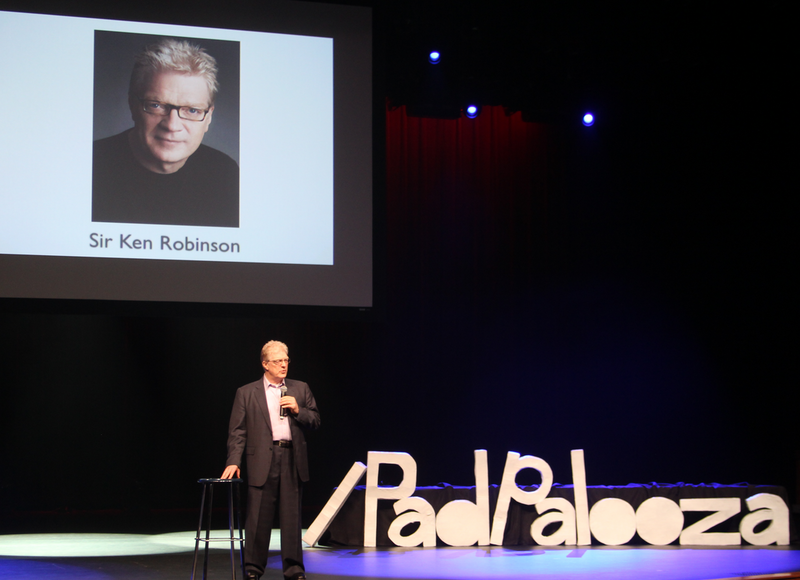 I share this backstory and course with you in the hopes that you’ll continue to work with parents on educating them about their children’s digital future. I also find a course like this strengthens the bond between school and parent in collectively raising their child.